Searching for used auto, truck & Jeep parts in Smithfield NC? Eastern Automotive Auto, Truck & Jeep Salvage is conveniently located in central North Carolina and locally serves the Smithfield, Four Oaks area. Eastern Automotive is a full service auto salvage yard offering "One Stop" shopping for all types of used parts for cars, trucks, vans & SUVs. We offer free nationwide auto parts locating services, local wholesale delivery, 90 day standard parts warranty, local, regional and nationwide shipping. Call for all of your used parts needs in Smithfield, NC. Used Auto Parts NC is part of the Automotiveinet business network. It offers tips and guidance to consumers looking to buy quality used auto parts for cars, trucks, vans, and SUVS. Find used auto parts in NC, Smithfield, Raleigh, Durham, Goldsboro, Dunn, Benson, Fayetteville, Fort Bragg, Wilson, Wilmington, Kinston. 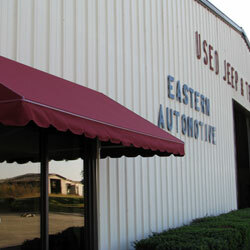 Eastern Automotive Truck & Jeep Salvage.